Speed up your response time. Write, format, personalize and send saved replies to common questions. Your support team will probably tell you that your customers are asking the same questions again and again. This means replying to them in the same way again and again. Dealing with the same customer queries over and over again can be time consuming. This is where Intercom's saved replies really help. Note: This feature requires you to have the Inbox product. To send a saved reply, just select the saved reply icon from below the reply area. From here you can search your saved replies and see a small preview before inserting. If you want to see the full saved reply, click 'Manage'. From here you can view, edit and create saved replies. You can also insert a saved reply quickly by using the # shortcut when typing your reply. Simply type # and start typing the name of the saved reply, and press Enter to insert the highlighted reply. When you find yourself writing the same answer frequently, click 'Save this Reply' under the dropdown next to the message. You can also create a saved reply from scratch. To do this, click on the saved replies button below the reply area, and click 'Create'. 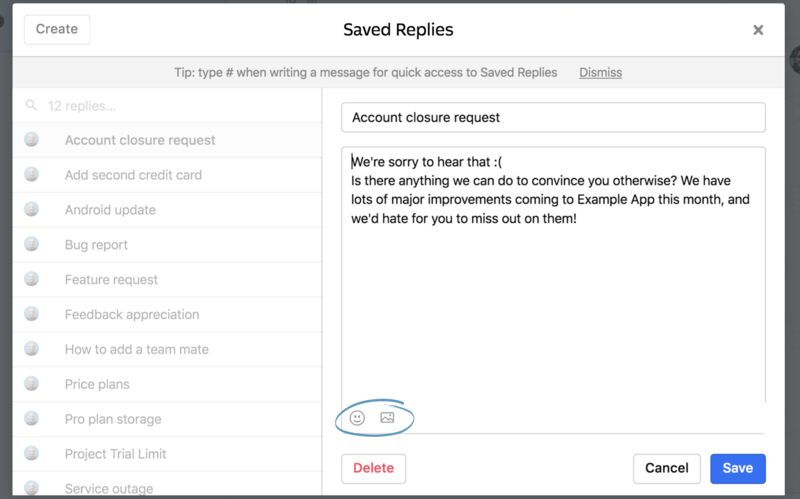 Best practice: Even when you're using a saved reply, it's always a good idea to add a short personalized note at the beginning or end of the message to stay connected to your users. If you use our Facebook or Twitter app, you can share saved replies with customers who chat to you from social media. Links will be presented as hyperlinks in parentheses. Bullet points will turn into dashes or numbers. Styling such as headers, bolds and italics will be removed. You can learn more about using the team inbox for support here.